I love many things about February. February break. There are only 28 days. Chances are we'll have a snow day sometime during February (this year we had 1.5 snow days). The last day of the month is my birthday. Speaking of birthday - I had a fantastic birthday! After some appointments that were rescheduled due to weather - I spent time with the family. Came home. Went to the gym to get in some miles. Ate my favorite dinner. Pizza. And then had more family over for Peanut Butter Ice Cream Cake. All around it was perfect day. Family. Fun. Run. Pizza. Peanut Butter and Chocolate. And tomorrow is the last day to join me in my Birthday Bash Virtual Race (enter here) - aiming to raise money to fight cancer for the Tri for A Cure tri relay I'm doing this summer. Since this is a February recap - I should update everyone on my Exercise Induced Anaphalaxis. On Thursday I went in for my skin testing to try to determine if I had any food allergies. Prior to this appointment I had to go 5 days of no antihistamines. It took a little creativity, but I managed to not have an allergic attack and still ran. I was lucky enough to get in two early morning runs prior to eating and then one run happened in the afternoon. Which is normally the time when I would have a reaction. But this time I ate at 11 am and then waited 4 hours until I ran. This was hard because I'm a snacker. Normally about 2/3 my stomach is saying feed me! But I held strong and did that run. It was only 3 miles. But a successful 3 miles! So, back to the allergy testing. The nurse began my appointment by checking on my asthma with the good old breathing test. And guess what? I failed. I failed the freaking breathing test! Apparently my lungs were operating at about 60%. That didn't sound too good and when the doctor came in the room to break the news to me, he didn't seem very pleased. He asked if I had run today. Yes. First thing this morning. Did I use my inhaler? Yes. He directed me to take 4 albuterol puffs, 1 minute apart, wait 15 minutes and retake the test. So, I did. And this time I sorta passed with an 80% lung capacity functioning. I asked about the allergy testing and he said it wasn't going to happen today. He explained that if he went ahead with adding allergens to my body that was already experiencing asthmatic symptoms my chances of a trip to the ER were pretty high. Since I didn't feel like hanging out in the ER for my birthday, I thought I should agree with him. He explained that I was going to be taking a steroid inhaler for a month and that I could then go back for a breathing test and if I passed, I could do the allergy test. So, now I'm back on a steroid inhaler. It's important to breathe. So now, in four weeks, I get to do the whole 5 days prior to my appointment without antihistamines again. I did it once and survived. I suppose I can do it again. Not suppose. I will do it again. I need some answers. Even if the results come back saying that I do not have food allergies. I'd just like to know. We know I'm struggling in the breathing department. But, the running part is going pretty well! 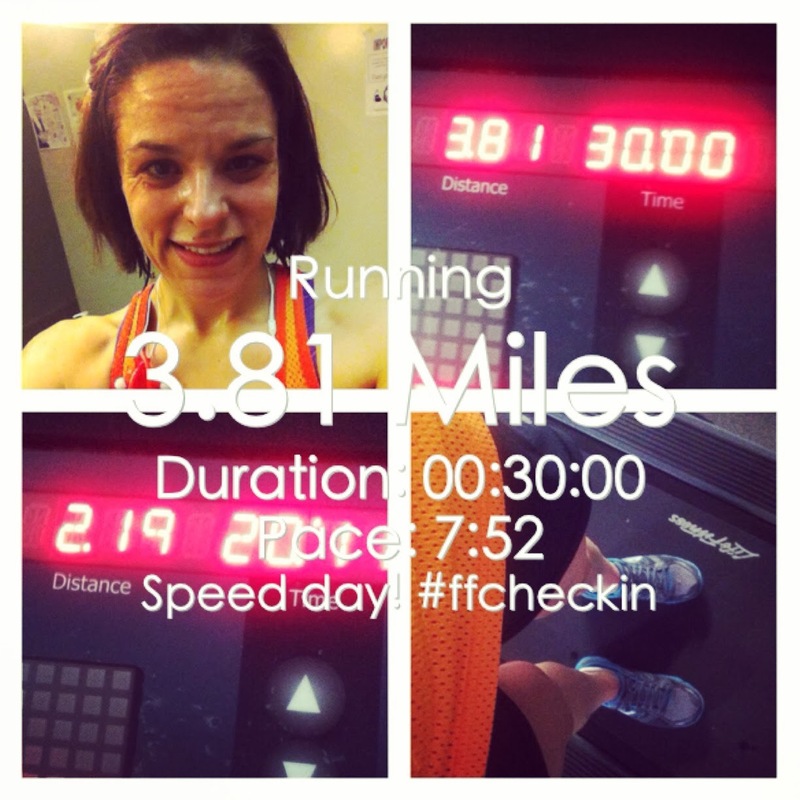 Miles run in February: 135! I'm feeling rather good about this. This past week I even managed a 41 mile week. I'm definitely building a solid base right now, getting in some fantastic speed sessions. And I completed the FitFluential 1000 Burpee Challenge! That was hard but it was a great challenge. But now I'm looking forward to FitFluential's March Challenge. Are you in? 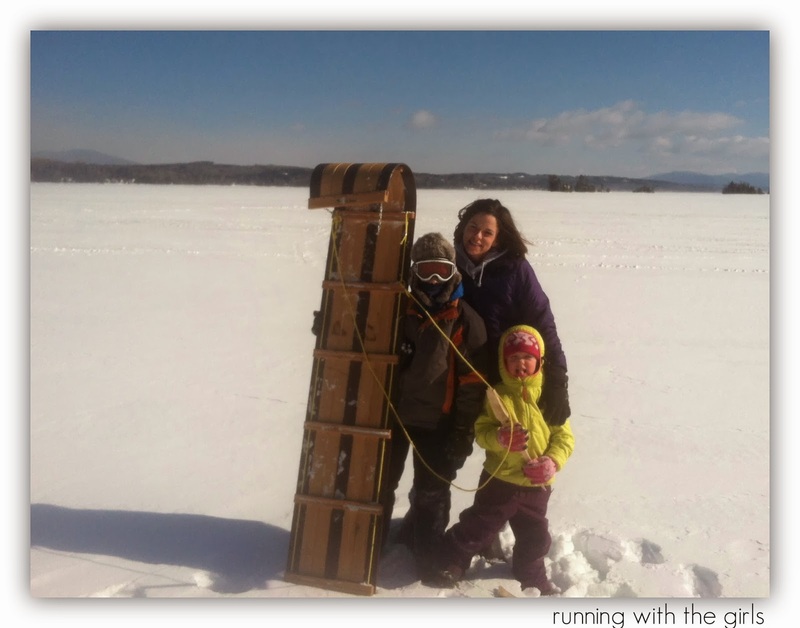 100 miles, running, walking, or hiking. I love it!!! 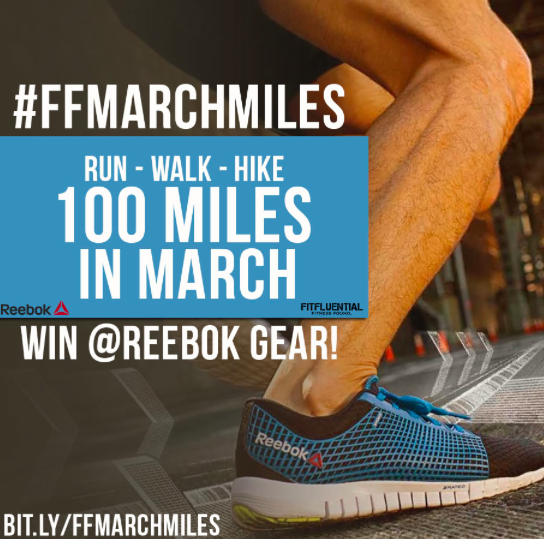 Plus there's a chance to win some awesome Reebok gear and I do love Reebok! How was your February? What are you looking forward in March? I'm looking forward to warmer weather. I has to be coming, right? 60%?! Just think how amazing you will be once you get all of this under control! Glad you had a great birthday! I dropped out of the Burpee challenge, I kept having back issues :( boo. 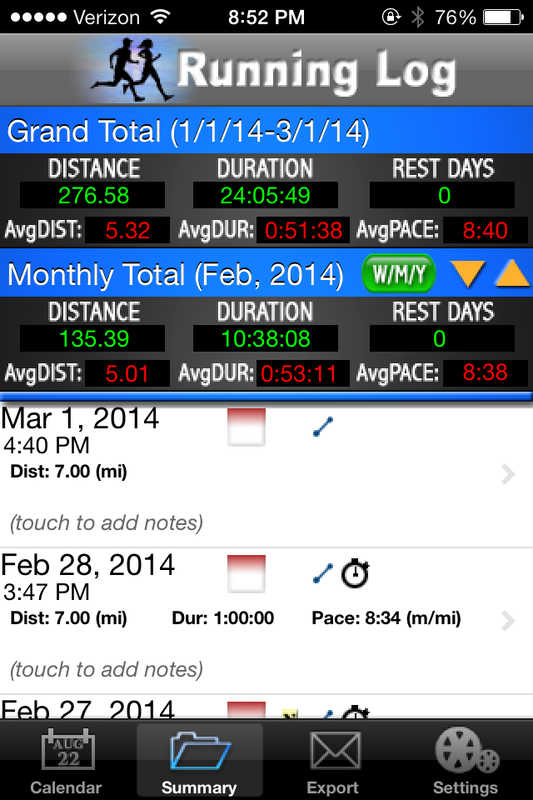 I ran 41 miles all of February, so nice job on your month. although part of my low miles was weather related... I really need a treadmill. 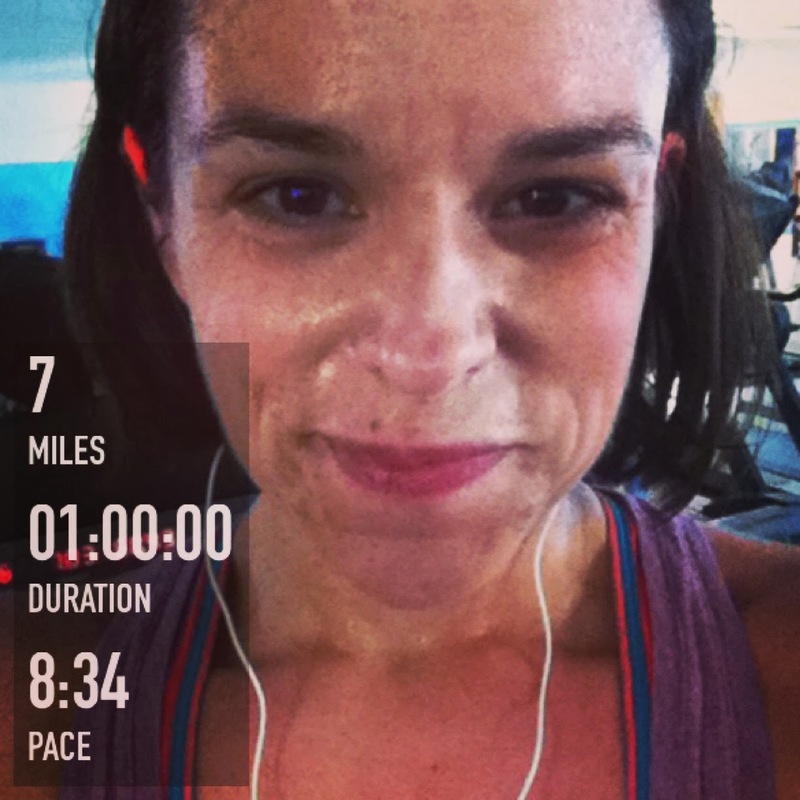 I never feel right converting elliptical to mileage, but I spent a lot of time on that! 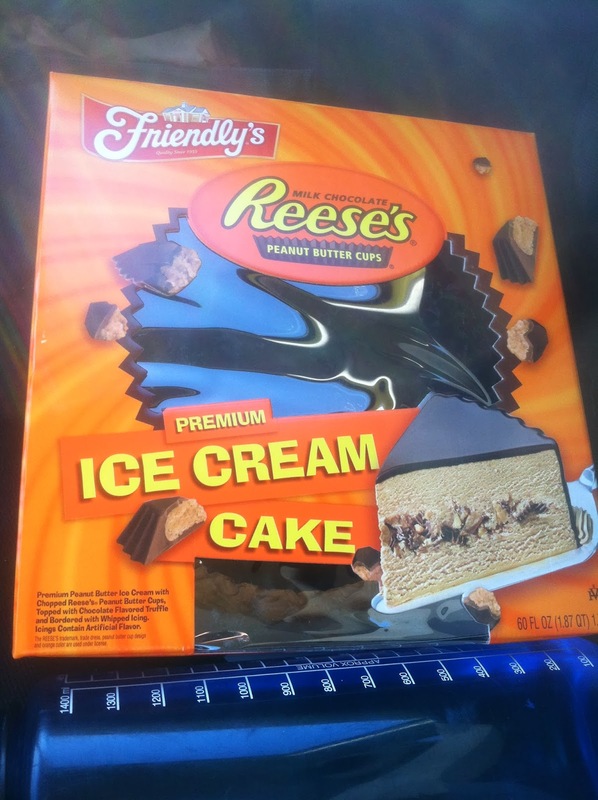 Peanut butter ice cream cake sounds heavenly.